Invisalign Yonkers dentist for kids, teens and adults. When it comes to Invisalign vs. braces, it’s usually a no-brainer, especially when you can rely on a Platinum Invisalign Yonkers Provider that’s open Saturday and Sunday to take care of your smile when it’s most convenient for you. Your Yonkers Invisalign dentist provides you with Invisalign braces and all the Invisalign attachments to help you achieve your smile makeover. An Invisalign retainer for an adult and Invisalign for teen users is a great way to straighten your teeth without anyone else knowing. Before Invisalign®, you had to wear metal braces to get a straight smile or just make do with how your teeth looked. Now straightening your teeth doesn’t have to involve a mouthful of metal. In fact, metal braces have become an outdated orthodontic treatment when going for a smile makeover. The Invisalign retainer lets you maintain your look without feeling out of place the way you might with clunky, unsightly metal braces. Your teeth slowly straighten out each day. Another benefit of Invisalign vs. braces is that no one else notices the difference. That’s because Invisalign aligners we use at our Yonkers dental center are nearly impossible to see. As you get accustomed to wearing them, you will practically forget they’re there! 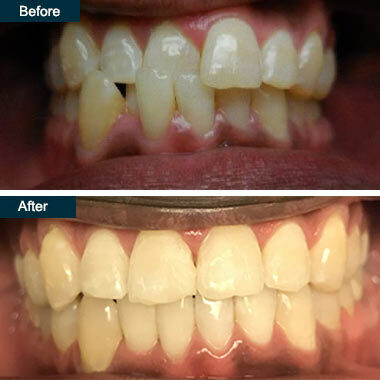 Although the clear trays are almost invisible, the results they provide aren’t. You will be able to observe a difference in about six weeks. Our Yonkers dentists are Invisalign Platinum Providers! We have received the best training for Invisalign and Invisalign Teen. As an Invisalign experts in Yonkers we have worked with Invisalign for a long time and treat a wide variety of orthodontic cases with Invisalign. To find out more about our extensive Invisalign experience check out Dr. Farokhzadeh’s provider page. He is a winner of the 2017 Galler Cup and was awarded the Top Invisalign General Dentists in North America. Invisalign aligners in Yonkers offers a new way to straighten teeth without the problems associated with traditional braces by using clear aligner trays. You don’t have to worry about carrying a toothbrush with you for when something gets stuck in your teeth. 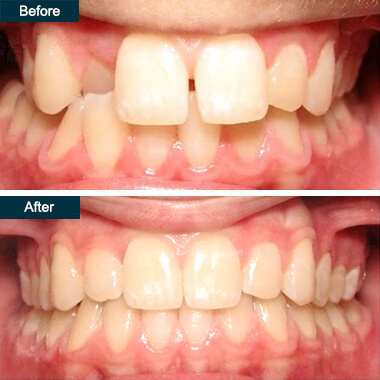 You get the same straight teeth you achieve with braces, but without sacrificing the way you look and feel. You and your licensed Invisalign Yonkers dentist come up with a plan that gives you the straight teeth and smile you’re looking for. Based on how your teeth are currently situated — if you have an uneven bite (malocclusion), for example, or overlapping teeth — your top Yonkers dentist determines how long you need to wear Invisalign braces. Since they’re virtually undetectable, Invisalign’s is an excellent choice if you’re nervous about how they affect the way you look. The results of using Yonkers Invisalign treatment braces include a perfect smile and straight teeth without the pain associated with traditional braces. Come see our top rated Invisalign dentists in Yonkers. We have worked with Invisalign for a long time and treat a wide variety of orthodontic cases with Invisalign. You’ve found an experienced, trained Invisalign Yonkers dentist, licensed in performing Invisalign attachments at your convenience. After X-rays and an examination, your Invisalign doctor dentist gives you an idea of how long the process may take for you to achieve straight teeth and a perfect smile. Some dentists like to show you 3D images of your teeth, whereas others use molds to base their assessment. Invisalign retainers are made of clear plastic that’s free of BPA; the molded clear aligner trays are custom-made and slide over your teeth. As your teeth move into the correct position, you receive new retainers from your Sunday dentist to accommodate the movement. You switch out the clear alignment retainers every week or so during your orthodontic treatment. If you’re an adult, our Invisalign dentists suggest that you should expect to wear retainers for a minimum of a year. When it comes to Invisalign Teen® for teen wearers, the needed duration varies based on the individual’s age and the development phase of the teeth. The results of using Invisalign treatment braces include a perfect smile and straight teeth without the pain associated with traditional braces, which can feel heavy at first. The wait time between Invisalign vs. braces can be shortened, thanks to a combination of both methods if your Invisalign dentist thinks Invisalign on its own isn’t enough. If you have a busy lifestyle, seek out the Yonkers Invisalign dentists open on Saturday. You need to have your Invisalign Yonkers dentist fit you for the trays. Invisalign aligner attachments can be uncomfortable, contrary to what most folks think. Although they aren’t heavy like traditional braces, they constantly put pressure on the teeth and gums, and can rub up against them. After having your first installment of Invisalign retainers put on, your Saturday dentist can provide painkillers to help while you adjust. Be aware that you must return to the Yonkers dentist’s office at least once a month during your Invisalign treatment — sometimes more often. You may go through a series of installments with your Invisalign attachments, getting them changed out as your mouth adjusts. It’s still important to take care of your teeth; remove your Invisalign retainer to brush and floss at least twice a day. You should be able to go back to normal activities the day after you receive your new braces from your trained New York cosmetic dentist. Take the rest of the day off to recover, however, since the chance is high that you’ll experience some pain from your Invisalign attachments. Make sure to leave them in from 20 to 22 hours each day, so they can properly straighten your teeth and you don’t get off track from the orthodontic treatment plan you created with your Invisalign Yonkers dentist. Everyone’s needs are different, so keep that in mind when using the product, especially with Invisalign Teen® for teens. As long as you keep your Invisalign dentist appointments, you should start to notice a difference very quickly. By the time your Invisalign treatment period is over, you can expect to have a whole new smile. Do you have any questions for Invisalign dentists in Yonkers, NY? Would you like to schedule an appointment with the best Invisalign dentist in Yonkers of Park Avenue Smiles of Yonkers, Westchester County? Please contact our Invisalign Yonkers clinic for consultation with the dental specialist.